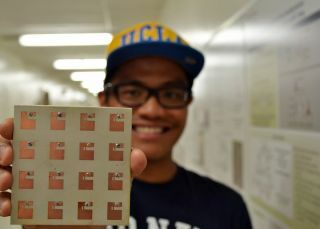 Graduate student Jean Paul Santos holds the 4x4 prototype antenna that may help Mars rovers speak directly to Earth, bypassing the orbiter that currently serves as a middleman. "NASA has a potential need for augmented direct-to-Earth (DTE) X-band radio communications for the Mars 2020 mission and for future missions," Yahya Rahmat-Samii, one of the designers of the new antenna system, told Space.com by email. Rahmat-Samii is a professor of electrical engineering at UCLA's Antenna Research, Analysis and Measurement Laboratory (ARAM). Rahmat-Samii has worked on initial antennae designs for a number of NASA space missions, including the Cassini probe, the Wilkinson Microwave Anisotropy Probe (WMAP) and others. Rovers on the surface of the Red Planet today use indirect or relay communications methods. Information is transmitted to an orbiter and then passed on to Earth. NASA's Mars Reconnaissance Orbiter (MRO), launched in 2005, currently fields transmissions from rovers and sends them back to scientists on the ground. NASA's Mars Odyssey spacecraft serves as a backup communication link. Launched in 2002, Odyssey is currently the longest-running Mars mission. If the long-lasting orbiters expire before NASA's Opportunity and Curiosity rovers, then the rovers will be unable to connect with Earth, essentially putting them out of commission. Although NASA plans to launch a third rover, Mars 2020, to the Red Planet in the near future, no new orbiter is in the works. Rovers carrying the new antenna could communicate directly with Earth when the rover and Earth are within line-of-sight. An onboard mechanical system would allow the arm holding the antenna to pivot in the appropriate direction. While present-day rovers can only speak to Earth twice a day for about 15 minutes each, the new design could dramatically increase communication time. "Depending on the relative orbital position of Earth and Mars, it could be as long as several hours," Rahmat-Samii said. Rahmat-Samii and two of his graduate students, along with engineers from NASA's Jet Propulsion Laboratory, developed the new antenna design using a new type of element originally built at ARAM for personal communication. The team devised an optimized version of the element and combined them in a 4 by 4 group as a prototype design, which they then tested. Known as a circularly polarized half E-shaped patch antenna element, the hardware sends and receives radio communications in a configuration that reduces the effects of atmospheric gas and particles, allowing the communications to travel through the atmosphere with minimal interference. "The unique antenna characteristics of this element made it a great choice for Mars rover [direct to Earth] antenna," Rahmat-Samii said. Rovers traveling to Mars would require a larger final antenna, composed of four rows made up of four of the original elements, for a total of 256 antenna elements. The full antenna, which would be just a little bit larger than a standard chessboard, packs more communication power in a tighter space than bulky dish antennas, with the added bonus of being easier to store during flight. It was designed to work within the stringent power and design constraints of Mars rovers such as NASA's Mars 2020.